You’ve fired the best, collected the rarest, and pondered the most obscure firearms the world has to offer. You’ve seen it all, but we promise – you’ve never seen this before. What happens when you improve on the pinnacle of perfection? In this world, there simply aren’t words to describe that feat. We could tell you that the Jones Deluxe is the most beautiful, elegant, and mesmerizing pistol the world had ever seen – but that would be too modest. Jones Deluxe – Our Jones 1911 pistol is unmatched in its quality and performance, a pistol truly deserving of the title American Icon. 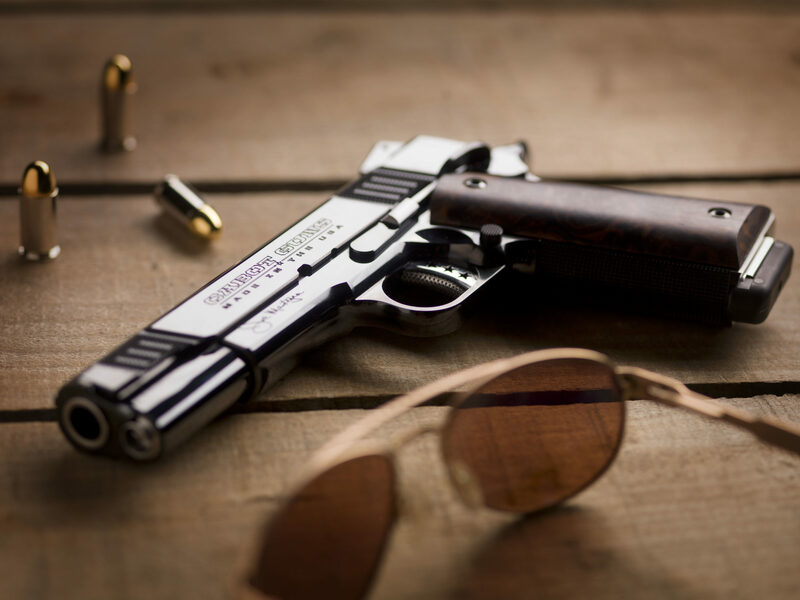 The Jones Deluxe, is an indescribable improvement on the perfection of our flagship pistol. An heirloom quality firearm customizable to include even the owner’s signature engraved on the frame as a lasting testament to history. So special that a limited edition production run of only ten units will be released in our first offering, the Jones Deluxe is the result of pairing our aerospace-precise machining and fitment with maybe the world’s greatest artisan Master Hand-Polishers. These rarities of human patience dedicate several days working under microscopes to hand finish every piece of the Jones Deluxe – from the Cabot Gun’s proprietary TriStar trigger to the Deluxe’s better-than-mirror polished slide release – to a final perfection of less than two-microns. For comparison’s sake, the average human hair is 75 microns across. The result of their efforts cannot be photographed accurately, and the breadth of human language struggles to provide a description befitting of their work. To first lay eyes on the Jones Deluxe is to immediately be rendered speechless, as the inspiration for these pistols – Joe Mantegna – was when he viewed its liquid-black finish for the first time. In even the sublimest of light, the Jones Deluxe appears to shimmer as a glass-topped lake under midnight starry skies, snatching the breath from your chest as it gazes deeply back into your soul. As a firearms manufacturer, it seems counter-intuitive to state that there’s ever a gun worth not firing, but with the wet-look polished finish of the Jones Deluxe glimmering back at you, it’s hard to do anything more than stare. From start to sale, the Jones Deluxe passes through up to one-hundred-twenty separate, ultra high-quality manufacturing processes. At each stage, it is carefully inspected by the finest eyes and equipment of the industry to ensure it exceeds our unmatched standard of excellence. It is touched by the gifted, passionate hands of no less than seventy Journeyman toolmakers as it undergoes metamorphosis from a solid block of American 4140 Billet Steel into the shapely form of the Cabot 1911. Among the options available upon commissioning your Jones Deluxe is the tantalizing offer of a matched set of left and right handed pistols. Perhaps the most beautiful firearm ever made, the Jones Deluxe is the ultimate combination of technical prowess and aesthetic achievement. Truly a masterpiece of hand-finished craftsmanship, the Deluxe’s place in history has already been firmly established. What remains to be seen is whether or not its place in your history will be assured. To place an order, select your pistol options below. On checkout you will be given the option to pay in full OR place a $2000 deposit to begin your build. Once we receive your deposit, we will confirm your options and start your Cabot.